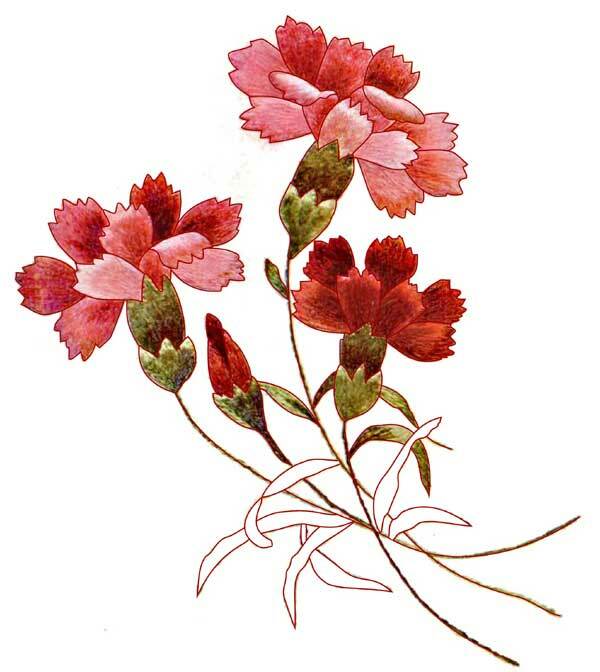 Thanks to Margaret Cobleigh for her genius in converting this image of carnations into a design for hand embroidery. The image is taken from A Treatise on Embroidery with Twenty Color Illustrations from Original Models. Art Needlework Series No. 8 by M. Heminway & Sons Silk Company. In the original book (which you can find online), the carnations are worked in silk in long and short stitch or thread painting techniques. The colors are gorgeous! It would be an exciting embroidery project to work on! 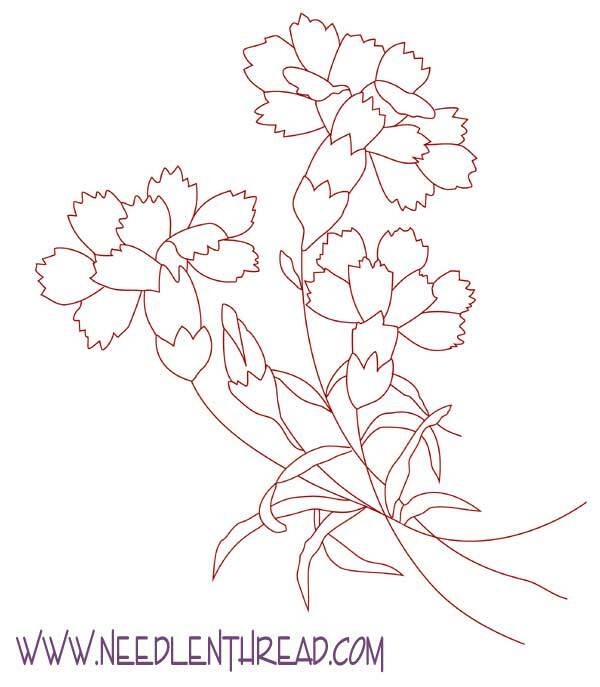 Margaret took the image of the carnations and traced it as a vector image (in Inkscape), so that you could view it with the outline and the colors, or just with the outlines. So I’m going to give it to you both ways here, but in jpg format, so that you can save it to your computer and print it if you like. It’s nice to have the color version as well, if you plan on stitching this project, since it gives you a good guideline for color choices and shading. You can click the following images for slightly larger versions, and if you want them bigger or smaller, you can resize them on your computer or on a photocopier. The first one here is the image with the color, though you can also see the outline around the image, and the addition of a few leaves. And here is the line drawing to trace for a pattern. Many thanks to Margaret for the pattern! Very pretty design. I remember seeing it in the previous post about the library, and thinking how pretty it would be to stitch. OMG! I have these carnations in my living room, stitched on black satin. My grandmother’s sister embroidered them years and years ago, and she had them in her living room for as long as I can remember. When she died, they were supposed to go to Jo’s daughter, but somehow my dad (her son) ended up with them. I caught my mother taking out “those ugly flowers” to replace it with something else – needless to say she is not a needleworker – so I rescued them and now have them in my living room. How neat to find the pattern! I am so excited – I will have to add this to my list of things to stitch! So gorgeous! Thanks to both of you, Mary and Margaret, for making this pattern available to all of us! I’ve scheduled a link to this post to go live on my blog mid-day tomorrow (Central USA time), December 20. I hope it brings you a few new fans.